Well, this certainly can’t be good. Kim Jong Un has always been known to flex his powers in showy, unorthodox ways, but his government’s most recent exploits have caused some serious concerns around the world. Over the past few days, several watchdog groups have painted a terrifying picture of a new possible threat: North Korea’s weapons division has been microwaving the same potato for 36 hours. Yikes. The world better be ready, because this dictatorship is not backing down. 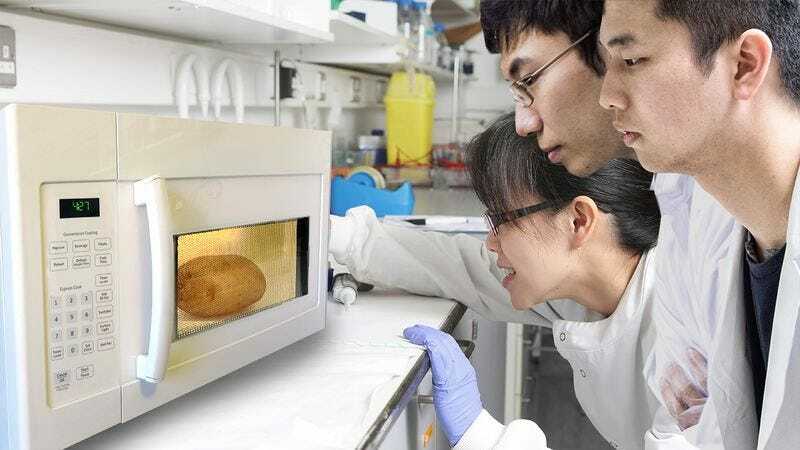 According to several memos leaked from inside the country, a group of three top North Korean scientists has been microwaving a single russet potato nonstop for over a day and a half, and Western officials fear it does not have plans to stop anytime soon. The weapons researchers reportedly opened the door of the microwave Sunday afternoon, put the plain potato in, selected the “baked potato” setting, and pressed “start.” As of now, the group has been awake for more than 36 hours straight, watching the potato rotate around in circles on a glass tray while furiously scribbling down notes. Uh, this is definitely starting to get scary. Satellite images taken between 8 a.m. on April 2 and 8 p.m. on April 3 show various weapons scientists entering the test facility in Pyongyang with oven mitts, tin foil, and forks, which are thought to be used to poke holes into the potato’s skin. One image in particular shows a scientist being dragged by his legs from the building’s entrance, perhaps unconscious but likely dead. Oof. While all this information is definitely cause for concern, hopefully countries from around the world can work together to keep North Korea in check. The next time we see its weapons department even handling some kind of kitchenware, someone needs to step up and put the pressure on.